Tired of rushing to get your teen out of the door on time each morning? Frustrated by last-minute trips to the store to buy supplies for that school project your child has known about for months? Concerned that your teen is simply overwhelmed by all she has to manage? Let What’s the Deal with Teens and Time Management: A Parents’ Guide to Helping Your Teen Succeed by Leslie Josel help. 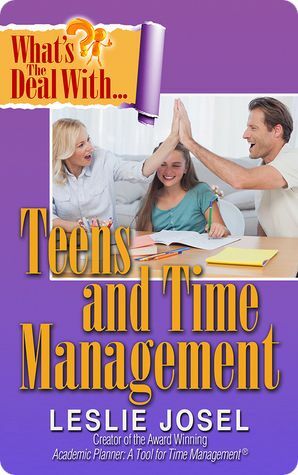 In less than 100 pages, Josel is able to guide you on how to help your teenage son or daughter get organized and develop the time management skills that will carry them through life. Not only did this book help me to understand how to phrase questions in ways that hone these lifelong skills; it also made me realize that my actions could either encourage or impede my children’s progress. What’s the Deal with Teens and Time Management will provide you with the information you need to make a change in your family’s lives. From insight into learning styles, to homework strategies, to dealing with procrastination, to managing distractions and more, Josel offers realistic expert advice and achievable goals for your teen. I firmly believe every family with teens or soon to be teens can benefit from reading this book. I received a digital copy of this book from the author through Pump Up Your Book. This review contains my honest opinions, which I have not been compensated for in any way.